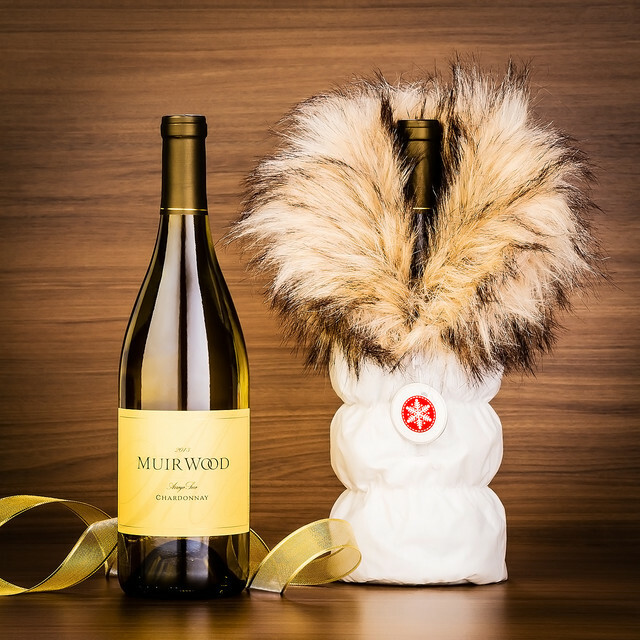 Just like a snow bunny, Muirwood Chardonnay Arroyo Seco prefers to be chilled! Lovely crisp tropical and citrus fruit flavors are enhanced by barrel fermentation, adding nuances of oak and vanilla to the smooth and lengthy finish. Bundle it up in this posh faux-fur-cuffed parka for a look fit for après-ski. 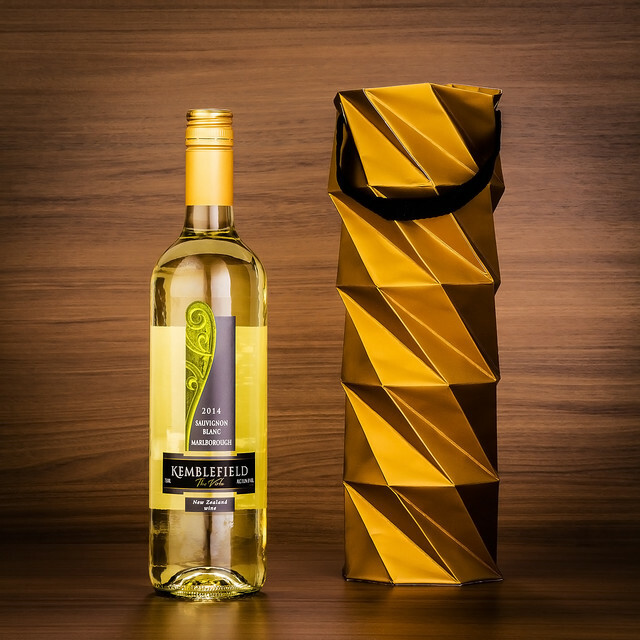 The winemakers of Kemblefield Sauvignon Blanc have designed a fantastically delicious white wine. Balancing tropical fruit flavors with a hint of citrus, this wine stands on its own. A passion fruit and gooseberry nose gives way to a palate sprinkled with ripe tropical fruit flavors, grapefruit and citrus. A full flavored Sauvignon. Carry it in this gold-tone origami tote for towering style. What do you get the person who has it all? Mailly Grand Cru Champagne is the perfect sparkler for those with exceptional taste. The freshness of lemon and orange blossom, mingled with hints of brioche, makes for that perfectly delineated fruit that comes from fully-ripe grapes. 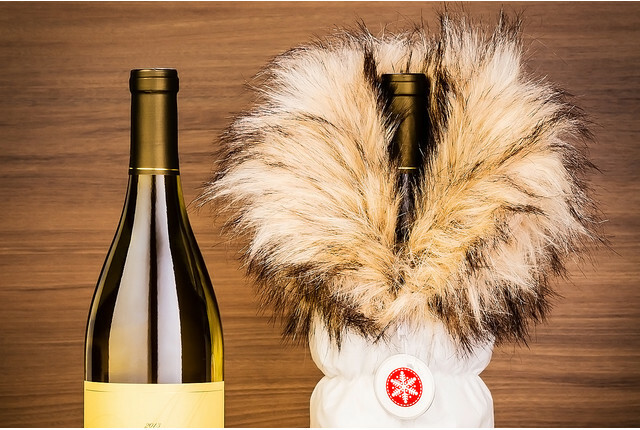 Wrap it in this luxurious faux-fur bottle bag for added flair! Just like the perfect couple, this pair of wines is perfectly in balance. Line Shack San Antonio Valley Cabernet offers robust, full-bodied flavors of a full-bodied and elegant Cabernet, with a lovely core of sweet tannins that provide a structural backbone to the rich flavors of blackberries, plums, and mocha, while the River Road Unoaked Chardonnay offers crisp and light-bodied refreshment with a fermenting process that retains the natural aromas and flavor components of green apples intertwined with floral notes. 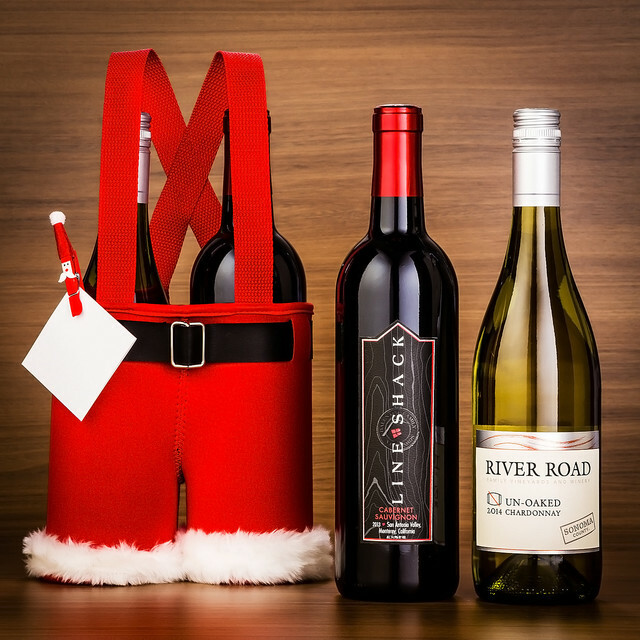 This two-bottle Santa carrier makes a cute tote for the holidays! First & Local's red blend exhibits timeless appeal to match any designer's eye for style. A medium-bodied, bold red blend with notes of deep black fruit, spice and crushed black pepper on the nose. The Syrah adds the perfect balance of raspberries and mint. 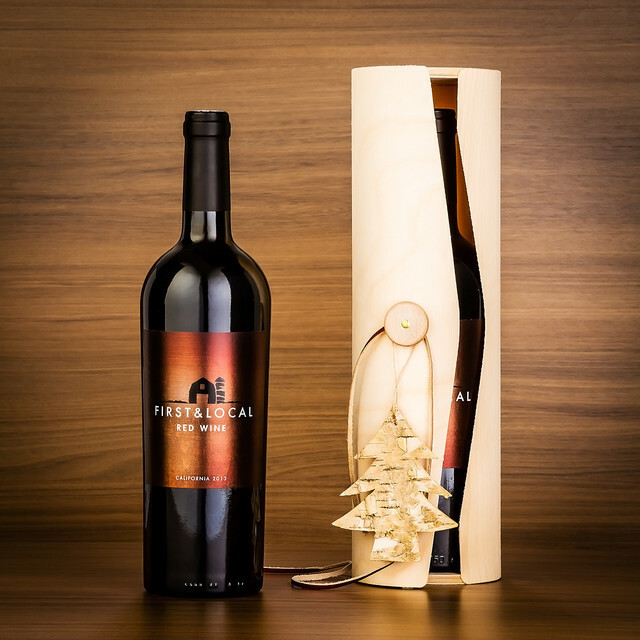 This birch veneer bottle cylinder offers an effortlessly sophisticated design piece to present this exceptional wine. 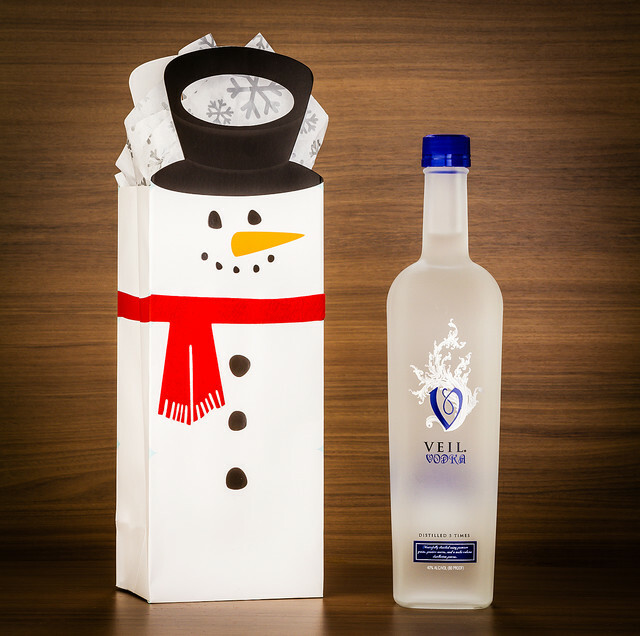 Let Frosty be your trusty guide in leading you to one of their best-selling spirits for the host who's life of the party—Veil Vodka. Distilled five times and charcoal filtered. Smooth with light flavors of American grain. Serve icy cold and mix your favorite cocktails with Veil's flavored vodkas this holiday season! There's nothing ugly about these wallet-friendly wines! 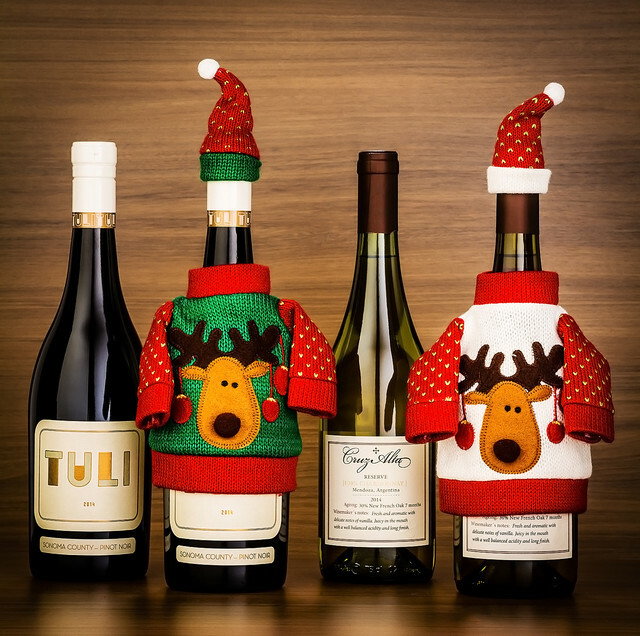 Tuli Pinot Noir and Cruz Alta Chardonnay Reserve will be masters of disguise at an ugly sweater party with these festive bottle pullovers. Tuli's velvety smooth Pinot Noir is rich with aromas of red fruit and sweet spice. The wine has medium body and finishes with some sweet vanilla toasty oak that lingers nicely. Cruz Alta Chardonnay Reserve is a lush 100% Chardonnay from the absolutely exceptional vineyards at the foothills of the Andes Mountains. Tree fruit flavors are balanced by light oak aging which ends in a long finish. Enjoy all of these with light appetizers for the perfect start to a party. Pertois Moriset Cuvée Selection is luxury at its finest with Pinot Noir and Chardonnay, from vineyards on the southern slopes towards Sezanne. This balanced Champagne has a creamy nose with a serious and deep mid palate. Precise fruit with a long finish and fine bubbles. 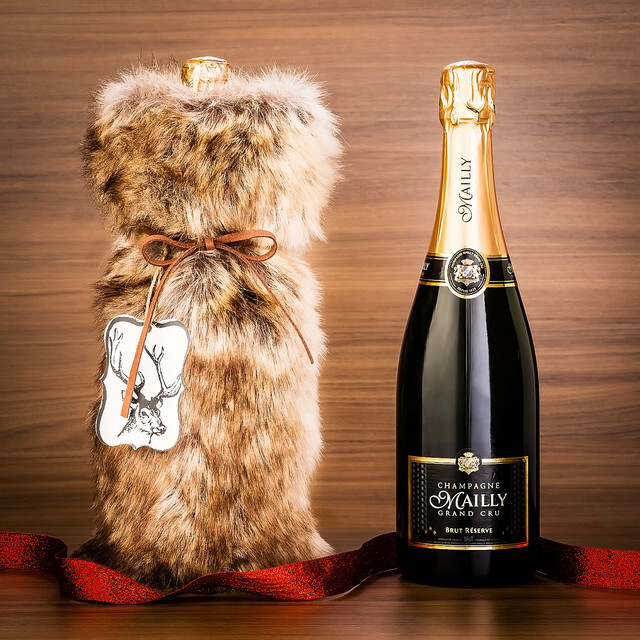 Drape this chic faux-fur wrap over this exceptional Champagne to add more glamour! Don't upset the neighbors with a bad gift! Show them how much you care with two of our favorite wines—Tesoro della Regina Pinot Grigio and Carson Ridge Paso Robles Cabernet. The Pinot Grigio has crisp apple and peach notes combined with hints of fresh orchard blossoms and a mineral backbone to energize this stunning Pinot Grigio from the heart of Italy's Veneto. The Cabernet is medium in body and possessing dense aromas and flavors of red berries, oak, and vanilla; it is an enticing Cabernet that is pure, clean, and approachable. 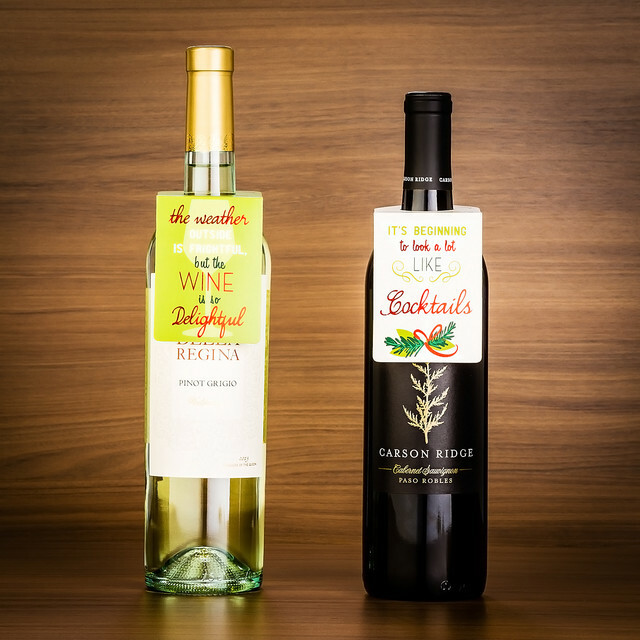 Dress the bottles up with these gift tags for a nice neighborly touch. In need of a good icebreaker for the hostess who likes a lot of sparkle? 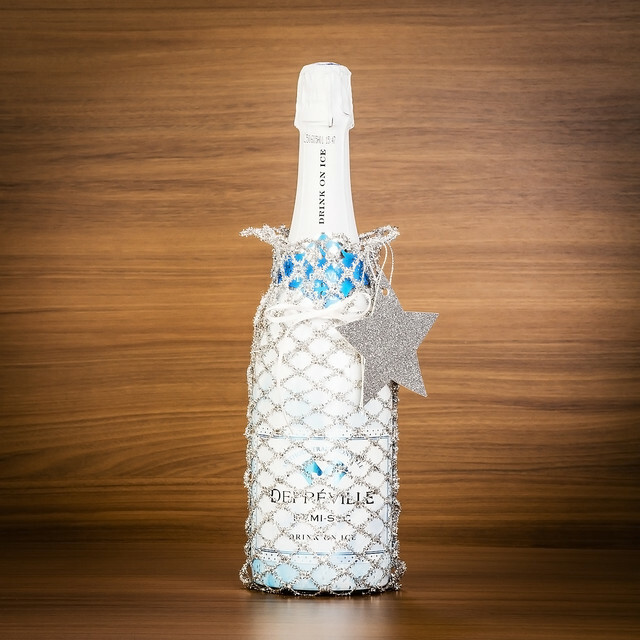 Depréville Demi-Sec sparkling wine is best served cold over ice and makes mixing and mingling way more fun. 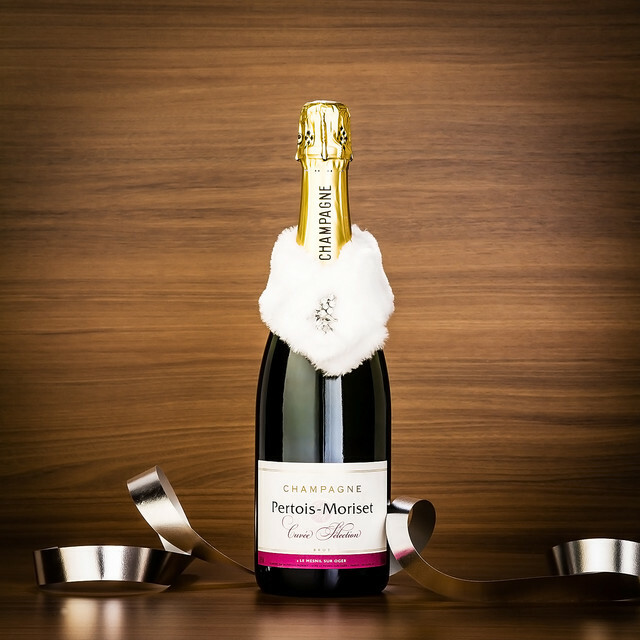 This French sparkler is luscious, creamy and smooth, with lingering aromas. Sweet, mellow and a very harmonious wine. Present it in this lattice tinsel wrap for an elegant display. 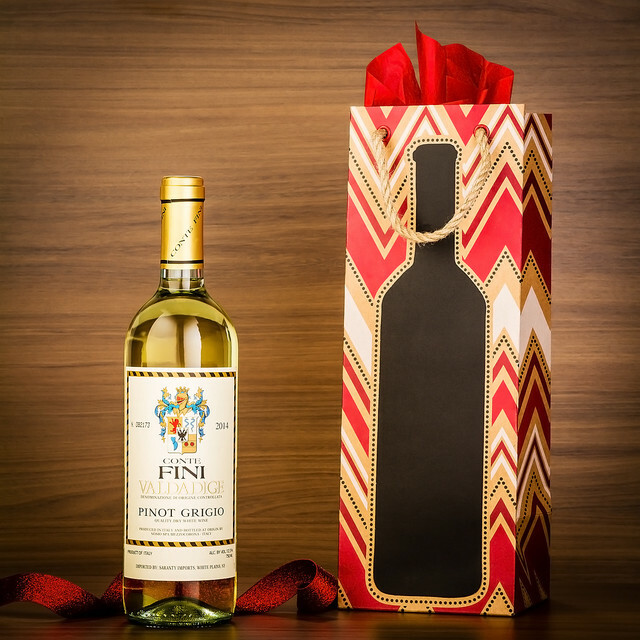 Conte Fini Pinot Grigio is a well-crafted Italian wine perfect for those who appreciate one-of-a-kind gifts. Dry and crisp with characteristic almond overtones, this 100% varietal wine features lively fruit flavors and a smooth finish. Write a sweet message on the chalkboard bottle tote to add a personal touch. Let the wine speak for itself. 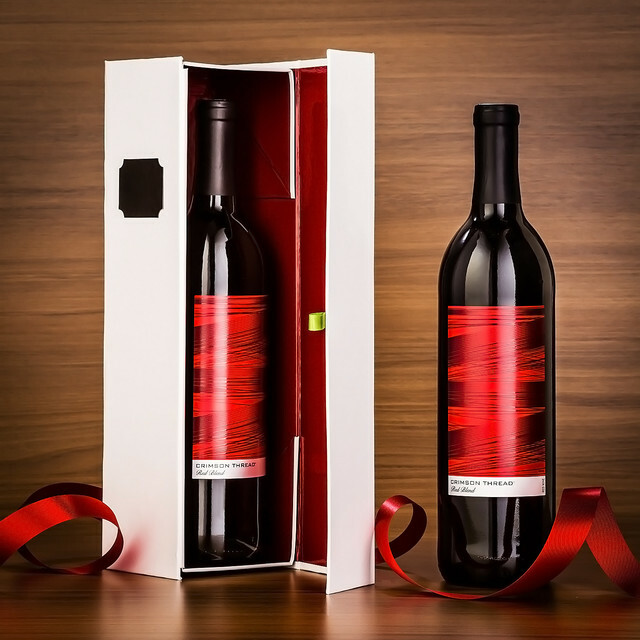 This simple, yet elegant, bottle gift box allows Common Thread Red Blend to do all the talking. Just like the Minimalist, the Crimson Thread will surprise and delight. You will find luscious aromas of dark cherry and blackberry, followed by tempting hints of brown sugar spice and supple notes of vanilla. Rondel Gold Brut Cava is always in fashion. "More fruity than dry," this "extreme brut" is filled with soft peach and nut flavors, their fragrance lifted by white pepper and floral tones of white lilies. 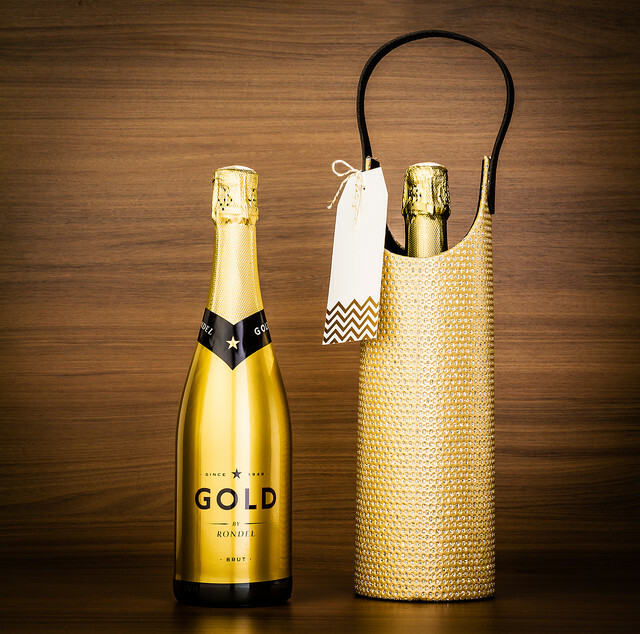 Serve up some serious style with this sophisticated sparkler and a matching bottle carrier! 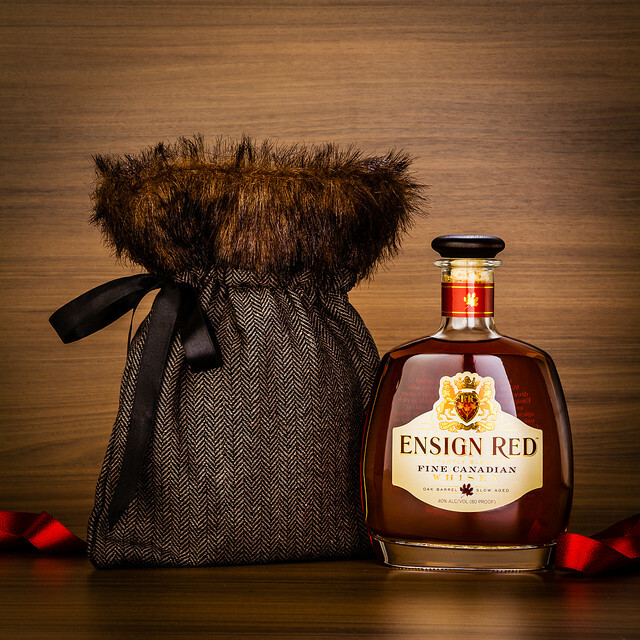 Ensign Red's smooth Canadian whisky makes the perfect gift to ease winter's chill. Ensign Red is a rich and creamy whisky with hints of dark fruit and rye spiciness mellowed through aging in select oak barrels. Wrap the bottle in this faux-fur bag for cozy style. For the host who likes to live on the edge! Cinnamon, spice and everything nice! Smooth and velvety, with aromas of cinnamon, caramel, and a touch of vanilla. Enjoy neat, or in your favorite cocktail. This fiery Cinnamon Flavored Whisky will set you ablaze with a finish that lingers on the palate. 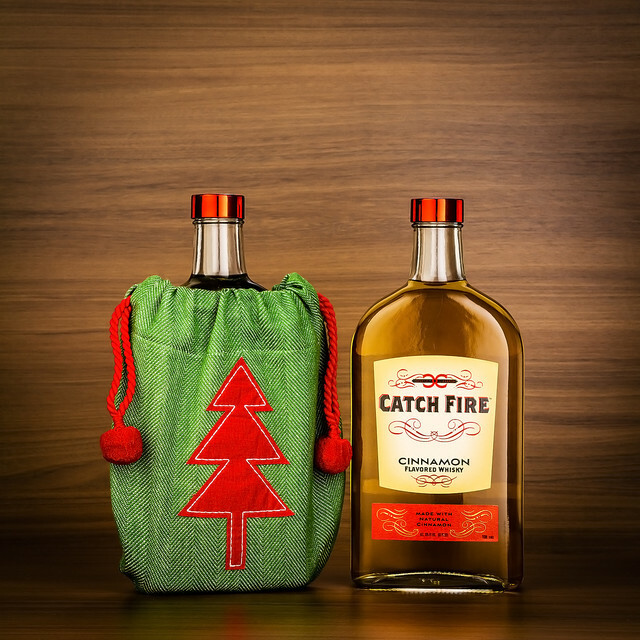 Be sure Catch Fire's Cinnamon Whisky makes it under the Christmas tree in this festive bottle bag. 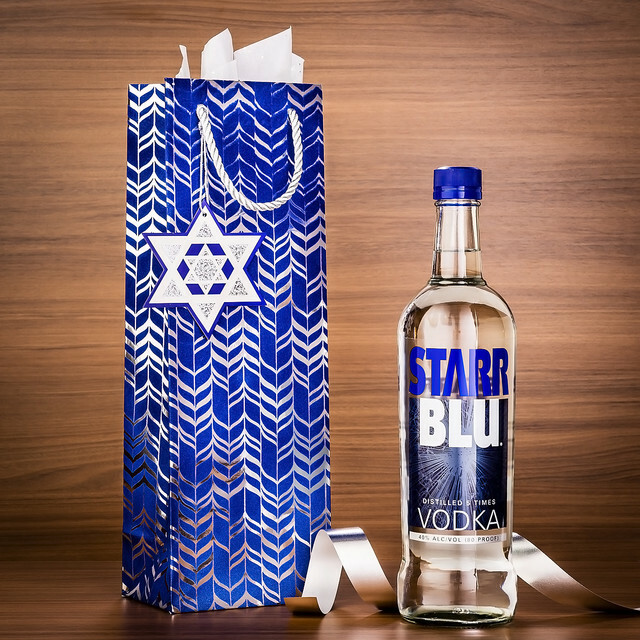 Perfect for the holidays, Starr Blu is a vodka you'll want to last longer than eight days, distilled five times and painstakingly filtered for a crisp, smooth taste, Starr Blu provides exceptional vodka distilled from the finest American grain. This chevron-print Hanukkah bag is the perfect bottle tote for the Festival of Lights. We tasted some of these lovely wines and agree - they are party perfect. If you're interested in having a little taste, join our Wine Wednesday in our Gift Wrap Wonderland. 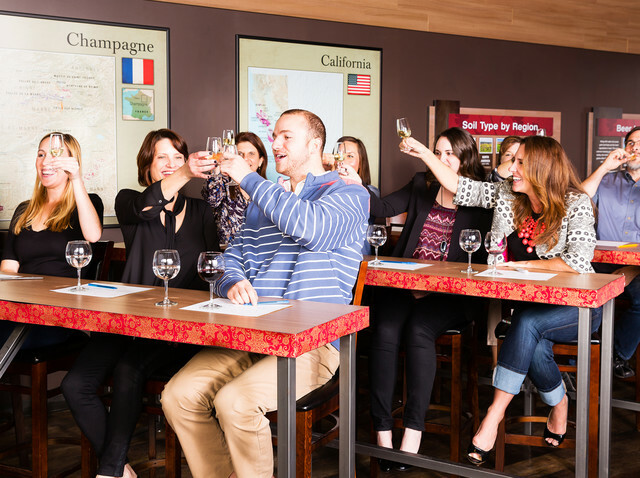 Grab your friends and come sip some great wines from our friends at Total Wine & More! Together, our experts and theirs will show you how to put goether a perfectly packages hostess gift! From sophisticated to playful, you'll get ideas for every hostess personality. And our experts will be on hand to show you how to wrap everything perfectly with gift wrap and bow demonstrations in our Gift Wrap Wonderland. Plus, there will be prizes every 15 minutes and the first 100 who arrive will receive a free wine tote! See below for your store's time and location.